BEAUTY lives up to her name! She is a very pretty black female who has white feet and a flash on her chest. She is a bit of a live wire -a confident yet easygoing girl. Her ears pop up when she is outside, taking everything in and enjoying her surroundings, she looks just adorable! She gets excited when it’s her turn for walks or attention and she is quite strong on the lead initially but she does calm down after a while. She is unfazed by most things and gets on with the other greyhounds, especially her kennelmate Sparky. She is a real foodie and is delighted if you arrive to see her with a tasty treat. She loves cuddles and grooming and visibly relaxes and enjoys the session. 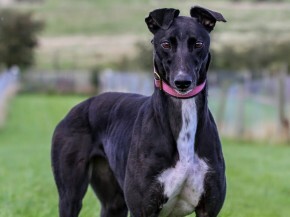 Come and meet this lovely girl soon. She will bring a smile to your face.